NEW YORK (CNS) — Set the TV series “Seinfeld” on Earth’s satellite, subtract the jokes and you’ve got “Mooncop” (Drawn and Quarterly), a strange and mildly poignant graphic novel. It’s a comic in which nothing much happens. In fact, inertia may be the point. 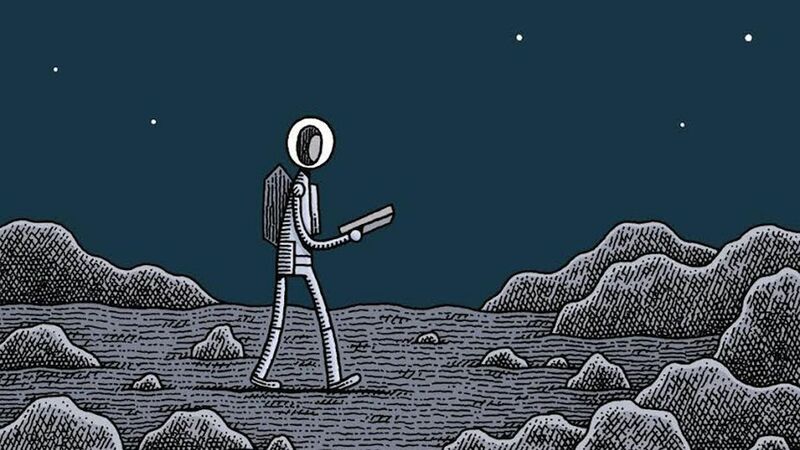 Written and drawn by British cartoonist Tom Gauld, “Mooncop” follows a policeman in an unknown year in an alternate future as he concludes his patrols of the lunar surface. The officer, whose name is not given, watches as the last few members of a once-promising colony return to Earth and the handful of remaining structures are dismantled. “Mooncop” is a small book of herculean understatement. A lost dog is found, the last store clerk is replaced with a robot, and a mechanical “therapy unit” is sent to counsel the central character since authorities suspect he’s depressed. The therapy unit malfunctions, and at one point Mooncop bumps into an automated version of astronaut Neil Armstrong, a relic from the Lunar Museum built when the community was new. Finally Mooncop is left with only one other person around; fittingly enough, it’s the woman who works at the Lunar Donut Shop. There is no portrayal of sexuality or violence in “Mooncop.” But its themes of loneliness and alienation could confuse or even depress younger readers. The events in “Mooncop” are depicted with haikulike simplicity. Gould is not interested in melodrama or pathos, but dull minutiae, the nuts-and-bolts endgame of what was once the great ambition of space travel. Gould recently described the origin of “Mooncop” to the website Wired this way: “The idea of a cop on the moon came from a 1960s tin toy I saw, which was a car with ‘Space Patrol’ on the side and a robot driver in a glass dome wielding a laser cannon. “Mooncop” is colored in a lovely, immersive blue and gray, with many of the panels offering silent testimony to the stone loneliness — but also the tremendous beauty — of the dying outpost. Gauld’s characters are slightly thicker versions of standard stick figures. Yet that only seems to make them more vulnerable. Mooncop makes simple observations about his beat, the failing machinery, and the days when it seemed as though the colony would be a thriving enterprise. The dialogue in “Mooncop” is too underwritten, however; the abandonment of such a grand mission deserves a bit more exposition. While “Mooncop” is about the fading of expectations first ignited by the space program in the 1960s, the deeper themes is solitude. Mooncop’s situation is in many ways a metaphor for life, which often starts off with tremendous joy and expectation only to come up against the reality of our human limitations. The graphic novel contains mature themes. The Catholic News Service classification is A-II — adults and adolescents. Not otherwise rated.